Lisa Laporte, CEO in Petaluma, CA, gives advice on how to reuse old blog posts. After a blog has been established, it’s going to have good information and a large number of posts. Unfortunately, some of those old posts lose their luster and don’t get read as they should. Rather than just let them sit, a person can repurpose them. There are also going to be blog posts that did really well and are always relevant. Instead of letting those sit on your blog, find ways to bring attention to them again. 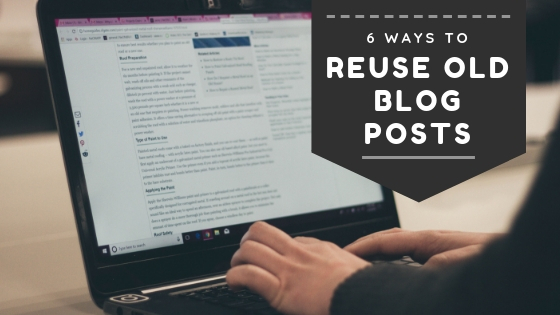 Here are six ways that old blog posts can be reused. In some niches and industries, information can quickly change. What was once fresh and new information can turn stale within a few years. If a blog owner wants to keep readers informed with current events, it’s probably best if to update these old posts so that their audience has access to updated information. This update can be done by adding new statistics, new images, or new examples. After updating a post, it’s a good idea to indicate the date of the update so that readers know when changes were made. You can also create a series and add a new post as changes are made if you feel that better serves your goals. Many individuals are better learners if they have something visual to look at. Introducing an infographic to an old blog post provides information in a new way that quickly helps readers understand a concept. There are tools on the Internet that can assist even nondesigners in making attractive infographics. Creating an ebook should be easy if a number of blog posts on the same topic are available to use. Some individuals prefer reading content that is longer; writing an ebook caters to these people. An ebook can also be used as a lead magnet and incentive for someone to give out their email address in order to receive the content. Old blog posts can also be republished on other sites where they will receive traffic. This technique may bring a fresh new group of people who haven’t been introduced to a brand. Complete articles can be posted on sites such as Quora, Medium and LinkedIn. A social media post can quickly be created by utilizing certain sections of an old blog post. Take a popular section or great quote and combine it with a fantastic image to attract current followers or fans. This hook can lead them back to a website or articles on a blog. People enjoy watching video representations of information. Another way that old blog posts can be used in a new way is by turning them into videos. In addition, another way to reach a new audience would be by turning a recorded webinar into a video and posting it on a social media site like YouTube.